Tired of the long drive down South or up North for that relaxing getaway? Can’t decide where to spend a R&R in Mactan Island? Worry not if you’re in the Metro coz an alternative destination can be found right in the midst of two bustling cities of Cebu and Mandaue. The Cebu Westown Lagoon, conveniently located beside MO2 Restobar at Subangdaku NRA (North Reclamation Area) in Mandaue City, may just be the perfect choice for a fun staycation. It is an Aztec-themed hotel and waterpark that has a man-made lagoon for guests to have a refreshing dip. Every traveler’s weary body would surely love their outdoor Jacuzzi pools too. Here are few photos I took on our visit on a weekday. Cebu Westown Lagoon logo upon entering the site. They have modern and spacious rooms for accommodation. Cottages for rent. Or use the common area, seen at the back, for FREE. Kids will love this playground with artificial grass for safety. A Kiddie pool with mini slides and water fountains. Sun bathing chairs can be found beside the pools. Check that Aztec-inspired statue. Sit back, relax and feel at home not away from home. Shot taken on top of the boulder landscape in the pool. Have a drink while in the pool in this sunken bar. Exciting waterslide at 20 ft. (yellow) and 30 ft. (green) high. Check out my POV shot of the waterslide. And last but not the least, probably my favorite, pamper your body inside the 2 Jacuzzi pools with its heated water jets best done when the sun is down. The resort also provides a great lighting at night especially the pools. One of the outdoor Jacuzzi that really soothes your body. Waterpark opens from 8:00AM to 10:00PM with an entrance fee usually at Php300 for adults and Php200 for kids (2-4 ft.) but they also offer promos and discounts. Please check out their Facebook page (Cebu Westown Lagoon) for their latest rates and packages. 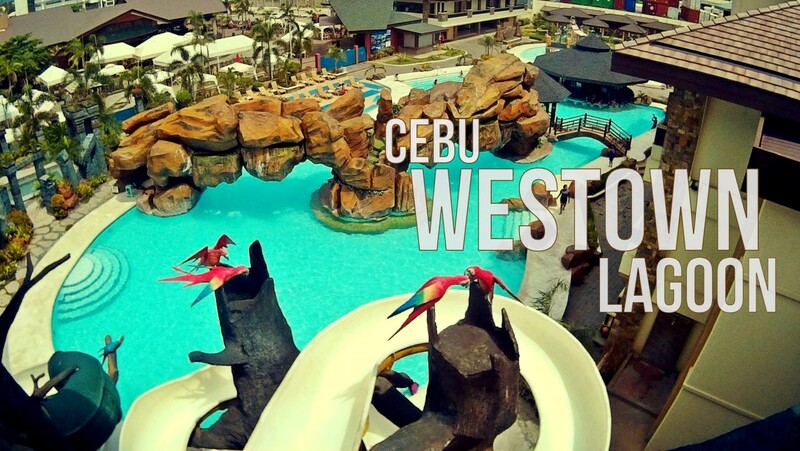 Cebu Westown Lagoon is undeniably a good alternative destination when your lazy to get out of town. Though personally, I think the price is not that friendly but hey you save yourself the hustle of a long drive. A quick tip, make your stay count and just enjoy this refreshing oasis in the heart of Metro Cebu. My concern before was that it’s expensive, hehe. But I think sulit lang kay you don’t have to travel far plus the place is really nice. they’re expensive but i guess it’s worth it. great shots, emjae! Yay! I’m going there this weekend and this makes me even more excited. They are expensive, I agree. But I think worth it ra pud. I always wanted to come here because it is just near our house. Your pictures makes me want to come there on the weekend na. My friends from Rotaract to unwind here just last week and I missed it since I have some deadlines to meet. And look what I’ve missed. Sayang but hopefully next time I can go to this place na. Mejo mahal sha but I think it’s sulit naman. This place looks great! Planning to visit this place anytime soon! My one hate about this resort is the heat is super hot and also the wind, compared to beaches, but when night time comes this is the place to be! Amazing kaayo ang mga pictures!! I’ve heard a lot from this resort and they are all positive feedback. I wish to go there during my works off. I’ve never been here. OMG I feel like I’ve been living under a rock! It looks awesome at night. It’s near mo2 lang dba? Gotta try this bi. This looks expensive but I think it’s still worth it! You are right Emjae! It’s perfect for those who are looking for a getaway within the city. The water slide seems fun!